Motto - "I mean well"
Knights helmet with hand holding a book, flanked by ornamental fronds. Heraldic shield - diagonal bar chequey with 3 blocks above and 3 blocks below. 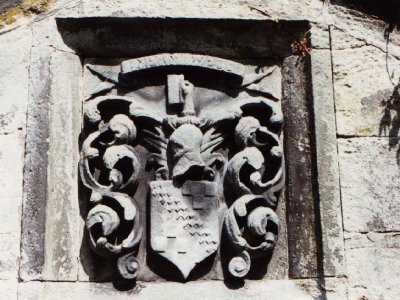 Notes:- The Heraldic arms are those of the CALLENDER family.